Amorn Village. 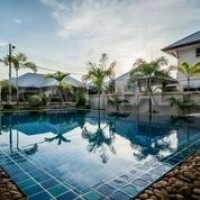 A modern pool village set along Soi Chayapruek 2 east of Jomtien beach. This is a very easy area to live with plenty of amities right on hand, plus the beaches can be reached in just 10 minutes and there are a variety of schools close by. These 3 bedroom homes come in a range of styles and sizes ALL with private swimming pools to suit individual buyers. Regardless of layout, these homes are well finished with a light, airy environment and generous room sizes. The developer includes a reserve water tank, high pressure water pump and 2 air conditioners. Houses start from just 6,000,000 Baht for a 3 bedroom, 2 bathroom home set upon 86 Wah (344sq.m) inc private 6m x 3m swimming pool. The largest plot available is 139 Wah (556sq.m) and other house styles features more bathrooms or larger swimming pools. Please contact us on +66 (0) 38 723615 or e.mail us [email protected] for more details, availability, or to make an appointment.